Have you been looking for Industrial property with utilities on or near the site in O'Fallon, Illinois? Here it is! 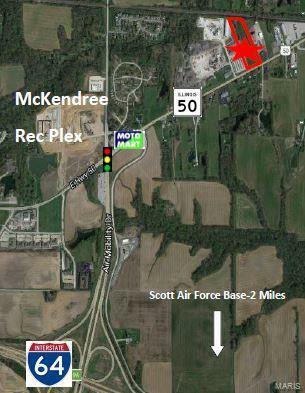 This 3-Acre site is conveniently located approximately 1.5 Miles from I-64 Interchange, (Exit 19B), 15 minutes from Downtown St. Louis, 30 Minutes from St. Louis (Lambert) International Airport, 10 Minutes from MidAmerica St. Louis Airport and 5 Minutes to Scott Air Force Base. 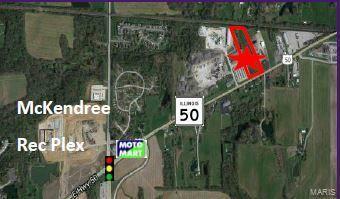 Property has 151' of frontage on State Route 50 with 14,400 Vehicles per Day. Located in MidAmerica Enterprise Zone. There are some preliminary engineering plans available.The O'Fallon/Shiloh, Illinois markets have grown exponentially with Scott Air Force Base as a neighbor and the recent construction of 2 New Hospitals, 2 New Hotels, the McKendree University Metro Plex Ice Arena, etc.Site is close to major retailers, restaurants, hospitality, etc.